It’s December, and the cold-ish weather has brought cool water temperatures to the Gulf and River at Steinhatchee, in Taylor County. 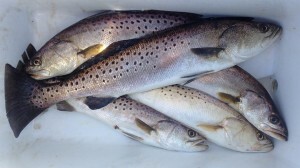 That mean lots of seatrout are schooling, and anglers returning to the Sea Hag Marina have been bringing in steady limits (5 fish, one can be over 20″, none under 15″). Many folks are catching trout in the deep river holes, especially those near marker #26 or in the Suicide Hole, just downstream from the Sea Hag. the Suicide Hole is “where seatrout go to commit suicide in the wintertime”. The river-caught fish are often a mix of spotted sea trout and silver (or sand) trout. There’s no limit to the number of silver trout that can be kept, or to their size. Both species bite well on live shrimp, moved slowly along the bottom. However, many are caught on artificial lure like Paul Brown Corkys or MirrOlure TT plugs, which can be found at most tackle shops in the area. Anglers with the ability to fish close to shore are finding trout over rock piles or near oyster bars, particularly on low water when the sun’s shining. The sun’s radiation heats the rocks, attracting bait fish (mainly mullet), which are followed by trophy trout. Trophy trout are considered to be those over 20-inches in length. Popular baits for these big fish are Corkys or Heddon’s Swim ‘n Image plugs, moved very slowly. Be sure to carry extra plugs as you’ll lose a few to the rocks and oysters. And if you’re worried about scratching your boat’s bottom, fish in the river!